Once Mail has been delivered to the Postfix server, you need to have a mechanism whereby mail clients like Mail, Entourage or Thunderbird can access the stored mail. This service is provided by POP3 and/or IMAP servers, not Postfix. IMAP servers have an additional functionality over POP3 servers—they allow the user to organise the messages into a folder structure. MailServe Snow offers the user a choice of installing either Dovecot or UW/IMAP for the POP3 and IMAP servers, but use of Dovecot is encouraged going forward. MailServe Snow users would probably choose Dovecot because this allows the user to create IMAP sub-folders, nested any level deep, unlike UW/IMAP which only allows a single level of folders. MailServe Snow allows UW/IMAP to operate simultaneously along with Dovecot, so long as these two services use two different sets of port numbers. 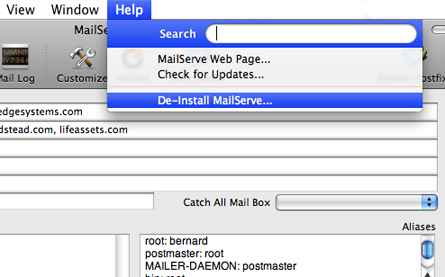 MailServe Snow uses procmail to integrate Postfix with Dovecot and SpamBayes to implement spam filtering. The mail administrator can set up custom procmail directives to be processed before or after spam processing. 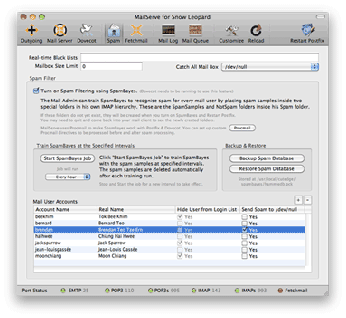 MailServe Snow includes new binaries and config files that are specific to Snow Leopard. You can do a de-install to clear the files left over from the previous Leopard versions of MailServe, if you have saved the configuration using the File menu. When you read back the configuration and Start Postfix, you will get all the new binaries loaded for use with Snow Leopard. The Help menu also contains links to the MailServe for Snow Leopard web page and it can be used to check that web site for new versions.